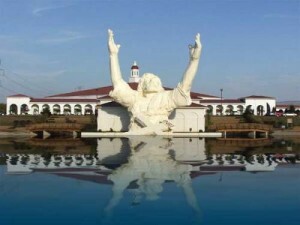 At a Dayton/Cincinnati-area church, efforts are afoot to rebuild a 62-foot idol of Jesus at Solid Rock Church in Monroe. For years, the steel, styrofoam, and fiberglass structure — situated along Interstate 75 — drew the stares of gawking motorists. It also drew tourists and churchgoers from Kentucky and Tennessee who apparently didn’t have enough kitsch to admire back in their own communities. The idol drew money from visitors’ tithes, and those tithes were spent on an ex-gay ministry that was co-founded by current PFOX president Greg Quinlan, who used this and other Ohio ministries to launch his national culture war against gay youth, marriage equality, and family unity. After the statue was destroyed by lightning last week, a few protesters pointed out to the church that it was worshiping a graven image in violation of the commandments of Moses. A churchgoer allegedly responded by shoving and threatening one of the protesters, and charges were filed. Gannett News reported today that a flood of donations and ample insurance money may allow the statue to be fully rebuilt by the end of the year.